The British as such had no interest in the seaside areas till the 19th century. It was in the mid years of the 19th century that resorts near the seaside became holiday places where people came to relax and enjoy. The railways provided an easy transportation to people to these seaside areas. The seaside locations were not given importance until the mid 18th century. However, things changed when a doctor named Richard Russell said that sea-waters have the minerals rich enough to cure any human diseases. This influenced many to come and visit the seaside. The popularity grew as time passed and the number of people that came also increased tremendously. A need was thus felt to arrange for books, games and other sources of entertainment to attract more visitors. Amongst the visitors that frequently stayed at these seaside resorts were Kings, Queens and other nobles and aristocrats. Apart from them, people from all social classes visited the resorts. An essential element at the seaside was the promenade. 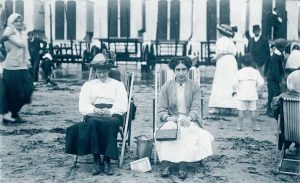 The people who visited the seaside resorts were often very apprehensive about their clothes and would carry some extra clothes with them. Women wore crinolines and hats on the beaches but the fashion in 1870 when crinoline was replaced by tight corsets and bustles. Straw hats were used by women on the seaside to protect the face from the sun. These hats were also known as uglies. 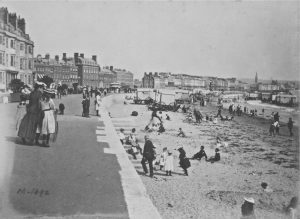 Brighton was most famous and the first major seaside town. The seaside was a place often resorted to by people to be away from the hectic life and have some time for themselves and their families. Trains were very convenient to travel distant places. With the passage of time, bathing machines were set-up near the seas. The seaside was also a place where a different culture evolved. There were people who came there for relaxing, some used the ambiance of the seaside to pen down their thoughts and for others, it was an educational centre. 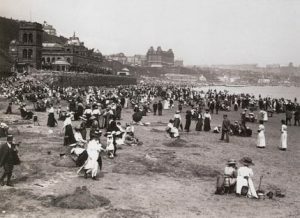 It can be correctly said that seaside played a unique role in the lives of the Victorian people.